The double wall glass Brewista Smart Dripper™ Flat V Cone Glass Dripper is made of durable double wall tempered borosilicate glass to maintain temperature, yet remain cool to the touch while making perfect pour over coffee. 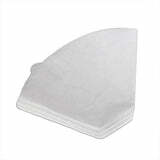 The tapered design accommodates standard #4 flat cone style coffee filters for better coffee extraction. The no slip silicone bottom is easily removed for cleaning and fits your favorite mug, or the Brewista 360 ml and 600 ml Glass Servers. Dishwasher safe.